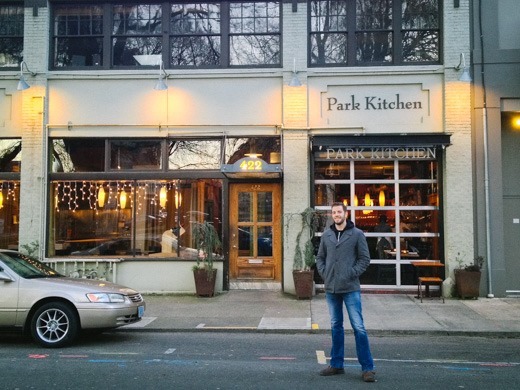 Park Kitchen is in the process of celebrating 10 years of being in business. Since most restaurants fail in the first year, we figure this puts them in the “old guard” category. They’ve been bringing back great drinks from throughout their history; this month it was the Bourbon Bijou, which was fantastic. We swirled our concoctions on the beautifully patinaed copper tabletops, and ordered the secret menu item we discovered in a dark corner. Since it was (a) a really big football night, (b) it was Sunday, and (c) we’re old and eat dinner at 5:30, we had the place entirely to ourselves. It was also the first night for one of the cooks; we assisted with the training by ordering one of everything on the happy-hour menu. It’s no trouble, guys, really. There are good reasons this place has survived. 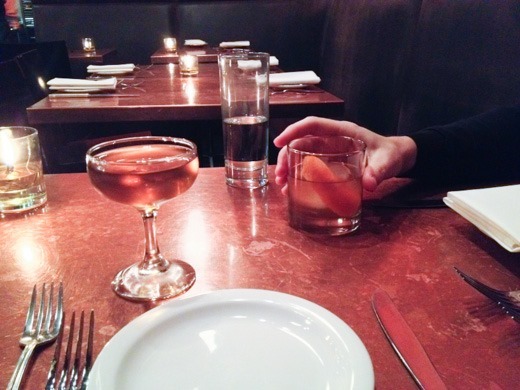 The service was friendly, the food and drinks lovingly crafted, everything was done perfectly. Highly recommended. This entry was tagged 100 Things, Park Kitchen. Bookmark the permalink.